The music that came to be known as Jazz had its roots in the Blues, the soulful expression of the sorrow which resulted from the Black Experience in America. The deep depression we sometimes associate with the Blues is the same sort of sadness that is often alcohol abuse. In fact, one of the origins of the term "the Blues" is "the Blue Devils", an old English expression for the intense hallucinations which result from drinking too heavily. Celebration can as much a reason as depression for hitting the bottle, and Jazz can be an expression of fun in the face of the sorrow of the Blues. 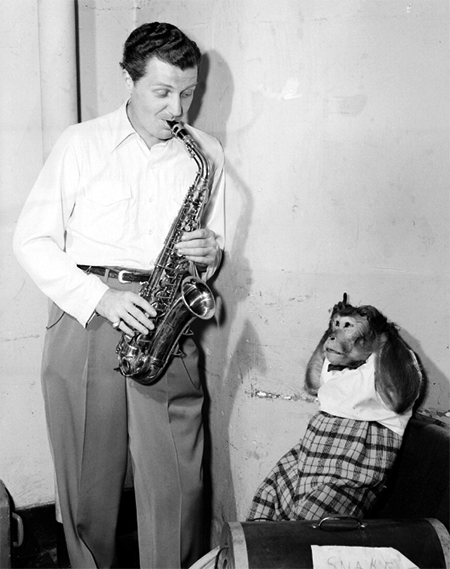 One of the Jazzmen who embodied the joy of the Jazz world was saxophonist and bandleader Charlie Barnet. Far from the sorrowful background which gave rise to the Blues, Charles Daly Barnet was born with the proverbial silver spoon in his mouth in New York City, 1913, and when his mother left her husband when Charlie was just two, she took her son and the spoon with her. Charlie grew up in the house of his grandfather, Charles Frederick Daly, banker and a vice-president with the New York Central Railroad. The family expected young Charlie to study law and go into business, so he was sent to some of the best schools, but after receiving a saxophone as a gift he often cut classes to play, listen to music, or look for gigs. He was just sixteen when the band he was leading was hired to entertain on an ocean liner. After 22 Atlantic crossings, he travelled to Hollywood in 1931 to make a splash in the hot music scene on the West Coast. Unfortunately, thanks to the Great Depression there was not much of a hot music scene yet on the West Coast. After scratching out a living as a sometime movie extra, Charlie returned to New York where he persuaded a friend at CBS's artist bureau to give him a shot as an orchestra leader. He was just 18 at the time. His first shot at recording came in 1933, but he found little success because he was constantly changing his style and reforming his band. Not all of the band breakups were Barnet's doing. He won an engagement at the Hotel Roosevelt in New Orleans in 1935 where he intended to introduce Swing Music in the birthplace of Jazz. Governor Huey Long listened to a session and was not amused, so the politico set up the band members to be lured to a bordello and then had the establishment raided. After helping several of his now unemployed bandsmen to find work with Joe Haymes and other bands, Charlie left for Havana where he found work as a gigolo for wealthy white women visiting the tropical city. The various bands Barnet put together were known as "The Blackest White Band Of Them All". Charlie was an outspoken follower of Duke Ellington and Count Basie, and by all accounts the admiration was mutual. Charlie was one of the first bandleaders to racially integrate his band, being more concerned with the musicianship and fun that a player brought to the group than the color of his skin. Charlie was known for recording without regard for commercial success and often derided other bands for playing syrupy, sweet music. Of course, Charlie could afford to play the kind of music that made him happy because of the silver spoon. Still, his stylings and musical chutzpah gained him the respect and admiration of his fellow Jazz artists. Count Basie's Orchestra was scheduled to follow Barnet's outfit in an engagement at the Palomar Ballroom in Los Angeles (set to be the first black big band to play the Palomar), but near the end of Barnet's run a stage curtain came in contact with an unprotected flood light, causing a fire which engulfed the temporarily empty bandstand. 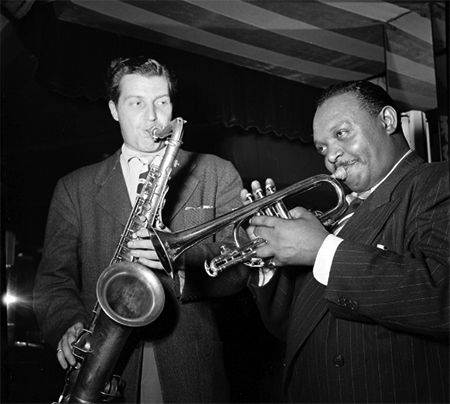 After their instruments and arrangements were burned, Basie's outfit lent their equipment to Barnet's band so they could finish their run, and the Count made the nearly unprecedented step of allowing Charlie to copy arrangements from Basie's own book (Basie went on to play the Paramount instead of the Palomar). Through his whole career, Barnet embraced the free and easy lifestyle of a Jazzman at the top of his career. In comparison to the regimented style of Glenn Miller, whose bands usually performed in uniforms even before Miller joined the Army, Charlie embraced the fun of playing Jazz for an enthusiastic crowd. Sometimes the fun got out of hand, they were fired from one engagement after celebrating a great set by taking an unscheduled dip in the hotel fountain. "I found the idea of life on the road very intriguing," he said. "I probably was more enthralled with the life than the music -- at first." Barnet was married at least six, and perhaps 11 or more times. He wrote that "I went through several more marital fiascos, but they were mostly Mexican marriages and quickly annulled, because they weren't legal in the first place." In 1955, Barnet married Betty Thompson, with whom he stayed for the next 33 years. He retired from performing in 1949, which he could afford to do as the heir to his grandfather's fortune. 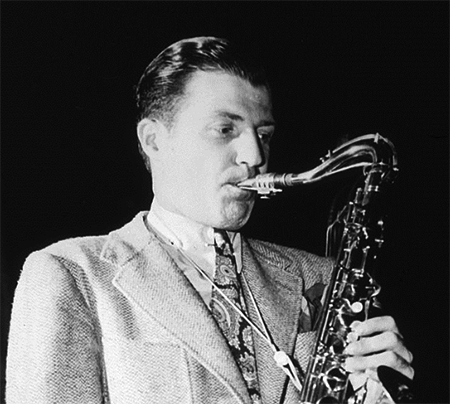 Charlie Barnet passed away from complications due to Alzheimer's disease and pneumonia on September 4, 1991, in San Diego, California. He was 77. Be the first to comment on "Charlie Barnet"